MAB’s recently completed commercial development - CubeOne - has attracted local business owners seeking to capitalise on the building's central location, excellent transport links and Narre Warren's thriving commercial precinct. According to MAB, the Narre Warren business precinct is within Australia’s 12th fastest growing city, with a projected population increase of almost 200,000 by 2041. 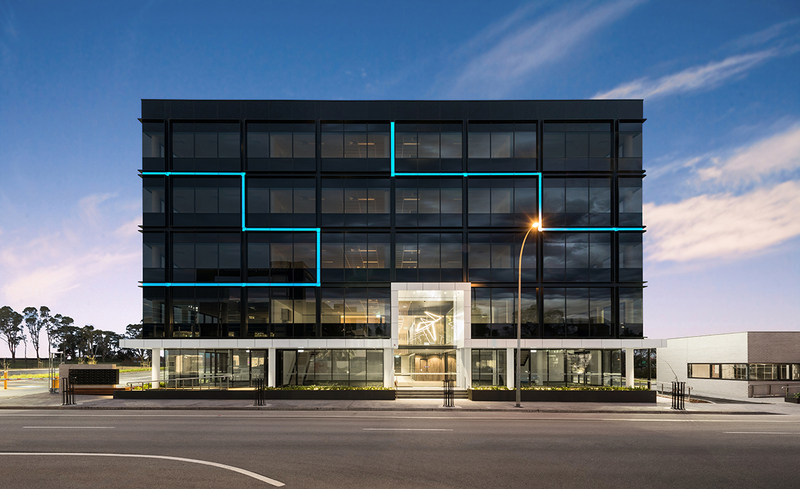 Located at 55 Victor Crescent in Melbourne's South-East, the $10m building has been designed by architects Watson Young to accommodate 5,000 sqm of strata office space across four-storeys, while promoting walkability and a sense of community. CubeOne features 40 strata office suites upwards of 45 sqm capable of accommodating a 300 strong workforce, in addition to a standalone restaurant tenancy,156 secure carparks, and expansive landscaped areas.. An illuminated external façade provides businesses with a strong visibility. Danny Lavigne, Managing Director of Blynx Insurance Services, is one of the first businesses to move into CubeOne. Lavigne’s company services many of those who live in the local area, taking advantage of the proximity to Fountain Gate Shopping Centre, the City of Casey Municipal Offices and nearby walking trails and cycle tracks. Ashwin Pandit, owner of Mocha Mojo Café & Lounge in Berwick, is another local business owner who made the decision to purchase into CubeOne. He was looking to expand his business, opening a new site close to his existing cafe to minimise commuting hours and mobilise existing staff. His new café, Butlers Kitchen at CubeOne, will open early 2019 and includes an outdoor seating area, capable of hosting up to 100 patrons. CubeOne follows a trend in commercial property developments decentralising Melbourne and providing businesses with affordable commercial offerings, reduced travel time and greater work/life balance. We’re seeing record sales at CubeOne because of a growing need for spaces outside the central city where small business owners can invest in their own premises in an environment that is conducive to a modern, mobile and integrated lifestyle. With limited CubeOne suites remaining, we’re seeing interest from a range of small businesses including accountants, medical professionals and investors who wish to own their own office and take greater control of their business investments. Business is booming in the South East and there’s not many office spaces that provide a high-quality and affordable offering. The office space is not only a great environment for employees and clients, but I have confidence there’s a huge business opportunity in the area, which is why I chose to invest, rather than lease. I think CubeOne will provide greater control over the future of my venture and we’ve got the capacity to grow and accommodate another 10 staff. It was essential to have a space that would provide future expansion and flexibility over time, that was convenient for employees to commute to and would be attractive to future employees looking for greater work, life balance. CubeOne certainly gives us all of that, allowing us to avoid the daily city traffic grind and we have all the amenities like parkland, cafes and secure parking right on our doorstep. With the local economy growing and not many business park cafes catering to the growing number of local office workers, I jumped at the chance to invest.